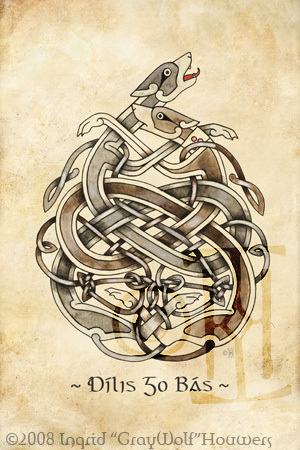 Matching the playful character of these wonderful animals with the Celtic knotwork, the two seem to be a perfect match for one another. In this image three ferrets are at play. While one is running, the other is grabbing onto the tail of the one in front while another grabs a hold of the leg. A Pathtag is a single-sided metal tag about the size and weight of a one Euro coin. The precise dimension of Pathtags are 23mm in diameter and 2.0mm thick. 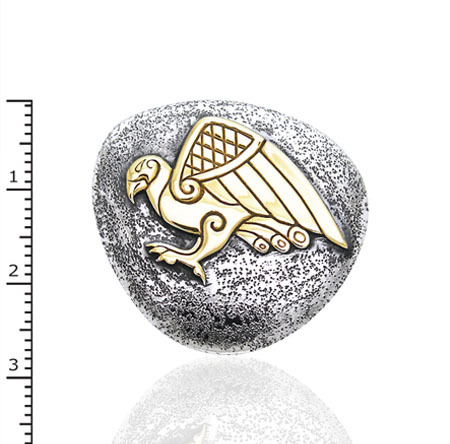 Pathtags are made from a solid iron base and are plated in a protective silver plating. Top carries the stag, with the cross between it's antlers and a gild-detailed halo. Visually it'll pull the readers eyes downwards from there, directing focus on the calligraphy. For the side-fillers, and in harmony with the vision of the stag to Hubert, a 'tree of life' pattern featuring foliage is depicted. The four corners feature icons of the hunt, along with gild detailing. One design has the hunting horn and sword, the other features the rifle and the fishing rod. Top banner, just below the main-crown, features two dogs/hounds pointing and flushing out pheasants. 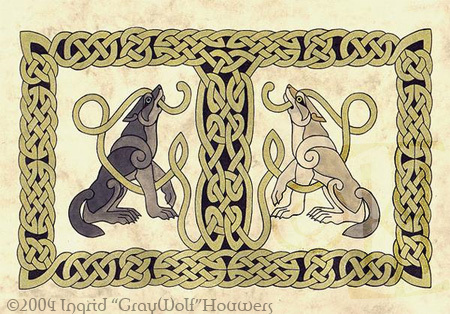 It is a repeated pattern for the side borders, but in the sides design we also see two hounds retrieving a bird. The half-circles feature falcons with rabbits in their talons, and the bottom border has two fishing figures (one male, one female). The ferret and rabbit corners stand as a reflection of life itself, a dance of life and death. And through the beast to God is true! yet love for game fires our gun. Did your game not suffer dread? Make brief its death and sure your strike! And badge of glory pure abide! Daß er beschützt und hegt sein Wild. Den Schöpfer im Geschöpfe ehrt! Die Lieb’ zum Wild den Stutzen führt. Ob auch Dein Wild nicht leidet Noth? Behüt’s vor Mensch und Thier zumal. Dann bleibet blank Dein Ehrenschild! 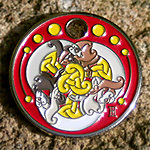 Four Celtic wolves running and dancing around, sneaking a lick at the golden wheel. Is it a dance of chaos? A dance around the wheel of the year? Whatever is going on these crazy Celts are having a grand time indeed judging by those smiles! 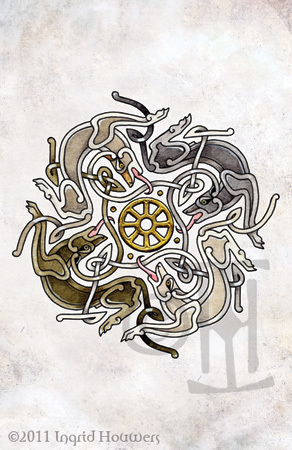 Our Celtic Wolves Wheel is now available as a fancy pathtag! You can hang them from your bag, key chain or even convert them into a pendant to wear! A picture dedicated to nature and creation itself. The human body will never stop to amaze me. 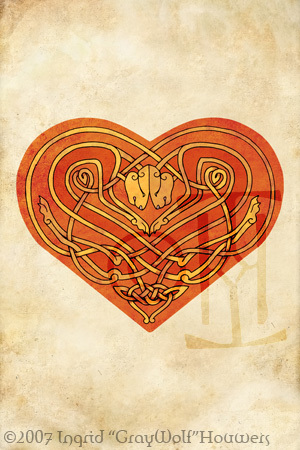 The Knotwork corner designs symbolize the ovaries and womb. Two Siamese guards, here to hold and protect your heart. A rather traditional styled illustration of a 'seanfhocail' or proverb; "Tabhair póg do chos an ghiorria" - To kiss the leg of a hare. In other words, say goodbye to something you'll probably never see again. 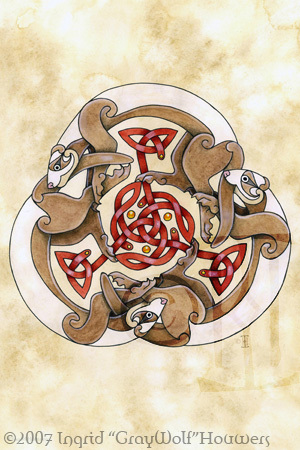 Shape-shifters play a important roll in Celtic mythology. Some people are turned into animals through jealousy, as is the case in the famous Children of Lir story, others choose to do so by magic. 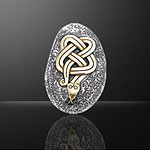 Our Celtic shape-shifter is now available as a fancy pathtag! 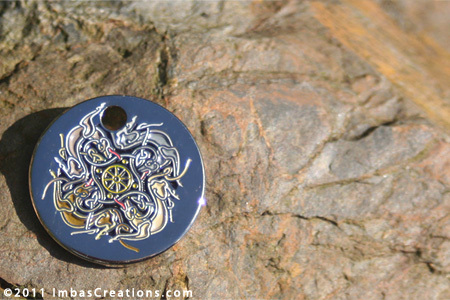 You can hang them from your bag, key chain or even convert them into a pendant to wear! 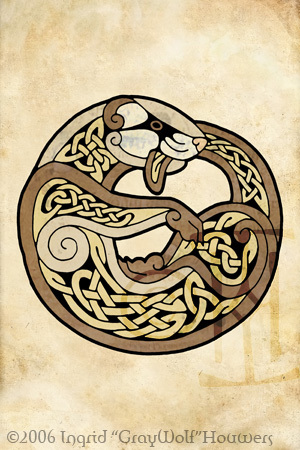 A cousin of the Celtic ferret, and a thieving Viking's best friend. Don't leave your hut to pillage another village far far away without one! It'll be sure to find the goodies you might overlook. 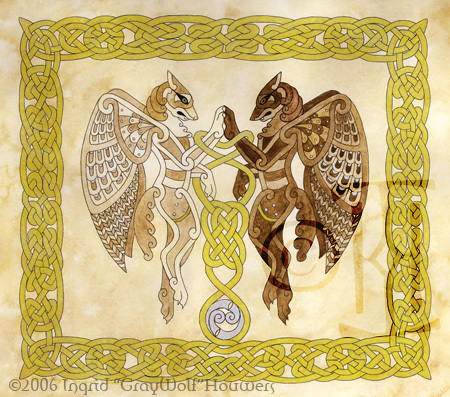 Two winged guardians stand on each side of a Celtic shield shaped knot. Triskel with animal heads including; boar, hare and a earth spirit. Center piece features a abstract bird head. Triskel design, French replica inspired. Gundestrup Cauldron replica, La Tene. 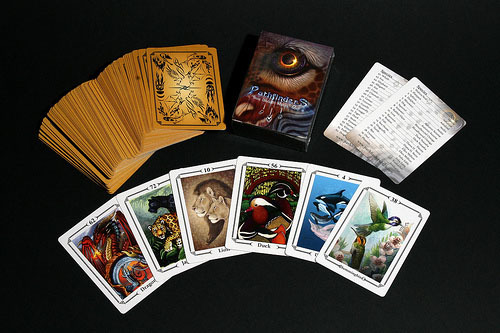 Pathfinders is a unique deck that celebrates the animal kingdom. Animals have come to mean a lot in the lives of humans. We use their names everyday for things like cars and sports team mascots. 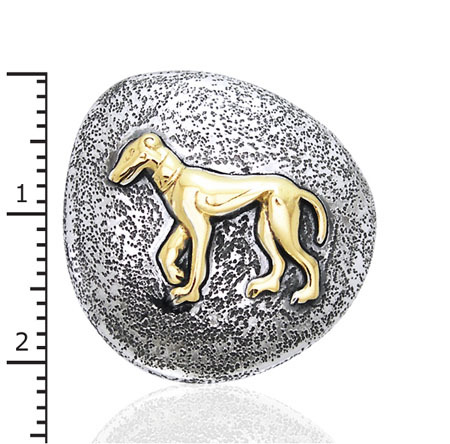 Animals have become symbols we look to for powerful attributes. These Totems have the ability to enhance our lives. This deck takes a look at several dozen animals all over the Earth, great and small, and their unique, special qualities that we can call on to further explore ourselves. Using this deck, you can find ways to enrich your daily life as well as to learn more about the animals portrayed. 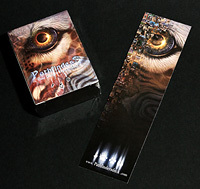 This deck is comprised of the multiple talents of many artists, and I myself provided 5 card designs. Each card meaning is detailed for you on the Pathfinders website (http://www.pathfindersdeck.com) along with spread example. Limited to 1,000 numbered decks worldwide, this is one set of cards that is not only a beauty to look at and a collectors item, but is also useful to you as well. Each deck comes with two gorgeous bookmarks, and we also have the option of adding the info CD, which features simple step-by-step guides for 4 common tarot card spreads and how they can be used with the Pathfinder deck. It will autoplay under Windows, but won't run on a Mac because of the software used to create the executable. 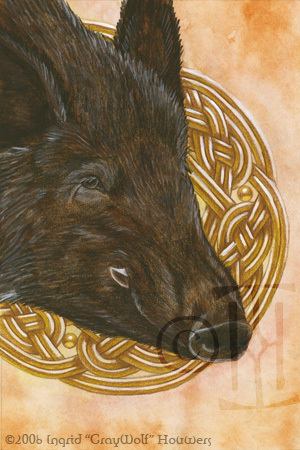 The wild boar is one of the most respected animals by Celtic warriors. With it’s imposing shape and size, the boar demands respect. Its strength and ferociousness in battle made it a well loved icon for warriors. Often featuring on shields and weapons, they hoped it would give them a fraction of energy from this animal. Boars were also associated with feasts and abundance. The Irish sea-god Manannán possessed magical boars, which could be eaten one day, and they’d re-appear the next, ready to be eaten again. 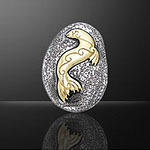 They can therefor also be considered a symbol of rebirth. 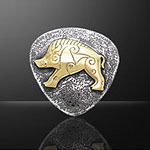 The Boar will help you face difficult challenges in your life, and battle them to ensure victory. 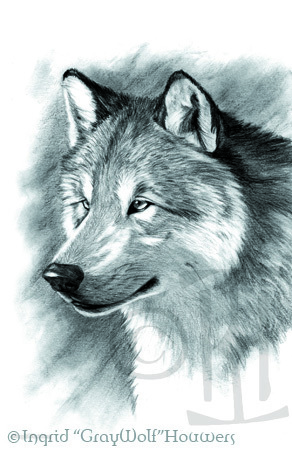 As the wild counterpart of the dog, the wolf is more connected to nature and the wilds. Fiercely loyal to friends and family, it is a frightening animal to those they oppose. Historically, bands of warriors that lived on the outside of the community protecting those within from harm, were associated with wolves. 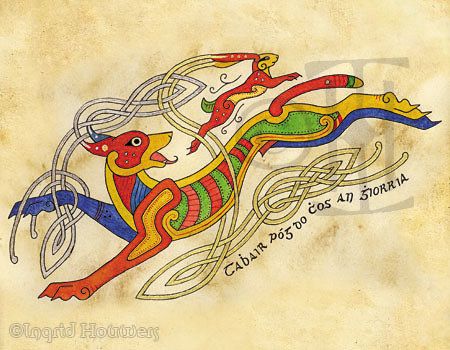 The Morrígan also takes on the form of a wolf during her battle with Cú Chulainn in a river ford. 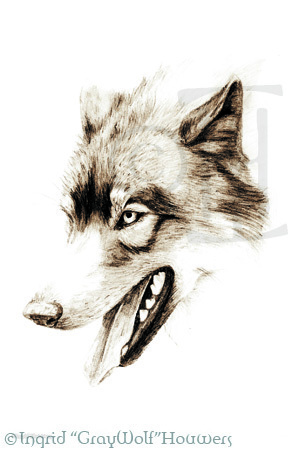 The Wolf will help you choose your ‘pack’ wisely, and to defend those that you love. At the same time he can teach you independence as well. 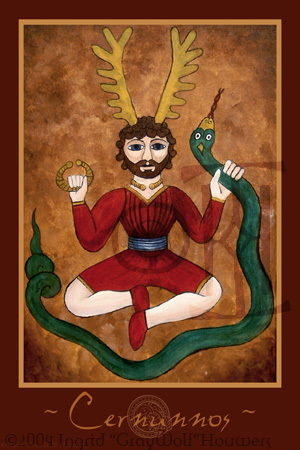 Snakes are strongly associated with rebirth and healing as well as wisdom. 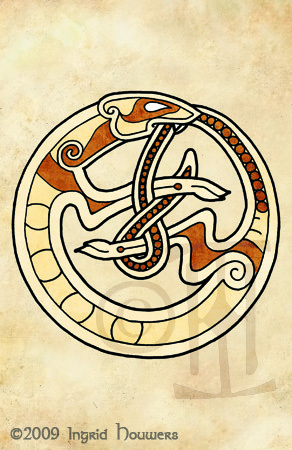 The Scottish lore on snakes is very similar to the Irish lore of the salmon. 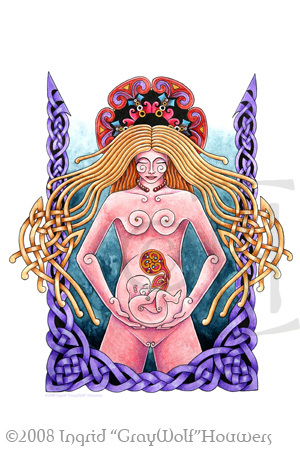 Many traditional poems about the festival of Imbolc, or the day of the goddess Brighid, include the re-awakening of the snakes at spring, as they come out of their winter hiding places. 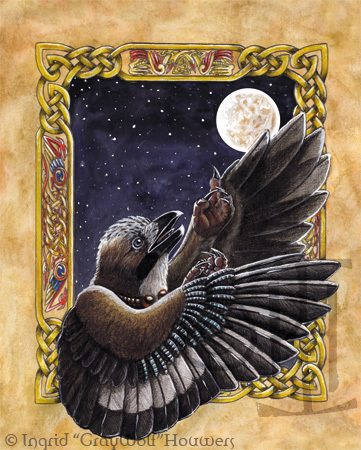 They are also found guarding important treasures in some Celtic lore, and can therefore also be viewed as guardians. The Snake brings rebirth and healing into your life, and allows for a fresh, new start. The salmon is among the oldest of animals in existence according to Celtic myth, and of all the old creatures it is the wisest. Deep in the Otherworld the Well of Wisdom can be found, and around it grow nine hazel trees. Inside the well lives a salmon, and each time a nut falls into the well the salmon eats it. 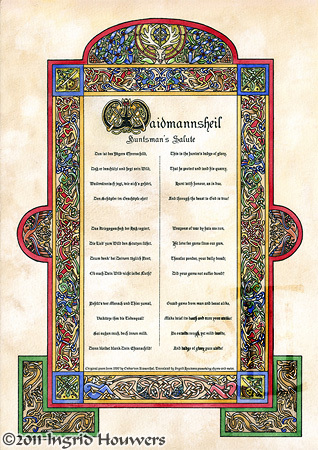 In Ogham lore, the Hazel is the tree of wisdom and knowledge, and for each nut of wisdom the salmon would eat, another speckle would appear on her body. The salmon can help you dive deeper and gain better knowledge that will grow into wisdom with time and patience. 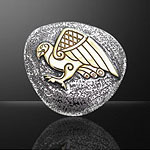 Many tales speak of eagles and falcons being amongst the oldest creatures on our earth, and that they possess ancient knowledge. They are believed to be able to stare into the Otherworld by a type of hovering in mid air often referred to as 'praying'. No other animal in this world has a sharper eyesight than a falcon. They have no trouble detecting the tiniest of movements from the greatest of heights. The Falcon can help you see things from a different perspective, and find things that no human could ever locate on their own. 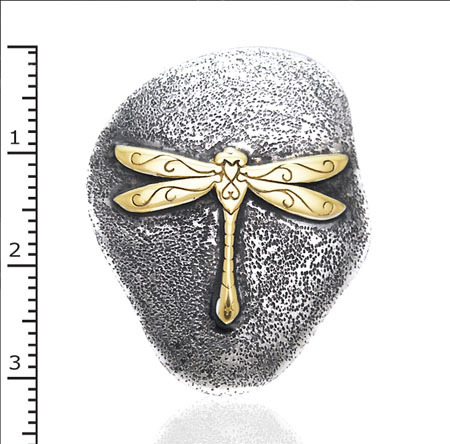 “Beautiful flies” are mentioned in many Celtic tales, and they refer to the form often taken on by a human spirit. 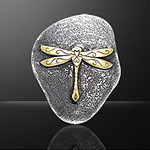 In some tales this is a butterfly, in others it may be the dragonfly. 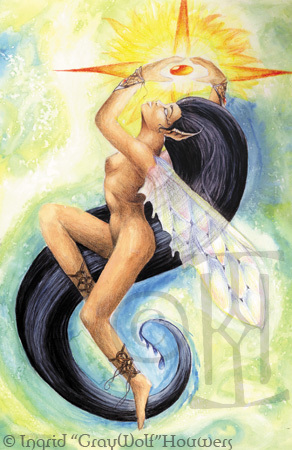 In the old Irish tale of Etain, she is first dropped into a pool of water where she transforms into a worm. Then later on, she changes into a ‘beautiful fly’, and gets swallowed by a woman who later on gives birth to her in the form of a child. This can be seen as the embodiment of the different stages in life, and the changes we all go through. It starts off as aquatic, then transforms and takes flight. 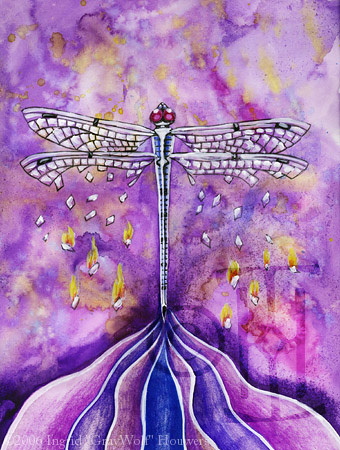 The Dragonfly helps ease us through our many transformations in life. These are rarely easy but through them we become stronger. Dogs are loyal companions and strong guardians. They’ve helped mankind throughout history during hunts and battles, as well as protecting family and livestock. The infamous Celtic hero Cú Chulainn, meaning ‘Hound of Cullan’, received his name after he made the mistake of killing the smith’s guard dog. To make up for Cullan’s loss, he takes on the role of the dog and becomes the guardian himself. 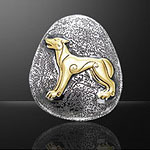 A demi-god, willing to take on the role of a dog certainly shows how important these animals are to the Celts. Dogs are the ‘tamer’ side of the same energy we associate with wolves. While they can be just as fierce and loyal, they’re willing to obey in order to help out. The Dog will help you defend your ideals, but at the same time keep harmony among those around you. Seals are believed to possess the ability to stare into the Otherworld as well as your soul. Much myth and legend surround these playful characters. One story tells that they originated from the drowned offspring of Eithne. Selkies were often mistaken to be seals, as they are shape-shifters. The females can choose to take on a human form by leaving and hiding their seal skin. If a human finds their skin, they would ‘own’ them and could claim them as their wife. But should the Selkie ever find her skin again, she would leave her new family behind to return to the sea forever, without ever looking back. The Seal is a symbol of pure beauty, always shrouded in mystery. She will bring its wearer both luck and joy. 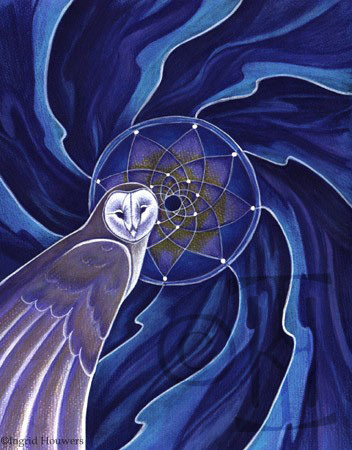 Often used a symbol of peace and harmony, the four spirals representing the conflicting elements are held in balance by the circle patterns in the center. 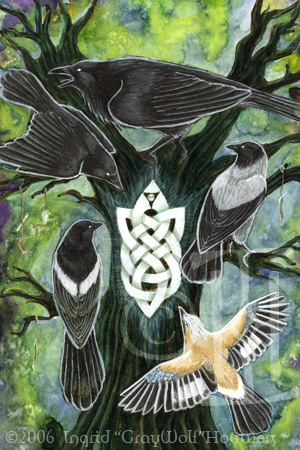 The Celts believed that all life moved in three eternal Cycles, continually regenerating at each point. The triskel was the symbol used by them to show this energy, and was used as a religious symbol. The triquetra was used as a powerful symbol by many. 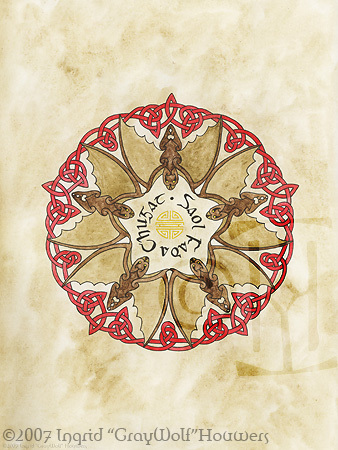 The three points in Celtic belief represent mind, body and soul. In Christianity it is known as the trinity knot, representing Father, Son and holy ghost, and in numerology the number three has always been a number of great power. Which ever meaning you choose, this is one of the most used symbols in history. 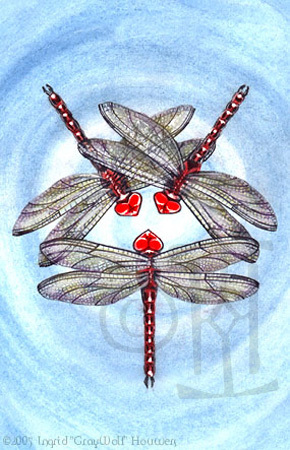 The triple triskel is the symbol that covers the three stages of life; birth, death and rebirth. With each triskel regenerating into the next it forms the eternal circle of life. The central triquetra represents mind, body and soul, while the three smaller ones around it symbolise the forces of nature; earth, sea and sky. Giving the wearer strength of life and the blessings of the realms. Found on the ancient graves, a tradition that passed from one generation to another. 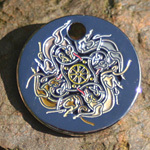 This evolving spiral as the central element, is the Irish alternative to yin-yang. In this case the three swirls each representing life, death and rebirth, the path all lives must take. The three spirals represent the goddess trinities, with the centeral spiral being the goddess herself. The circular disc is the cauldron, where the worlds divine knowledge and inspiration are brewed. 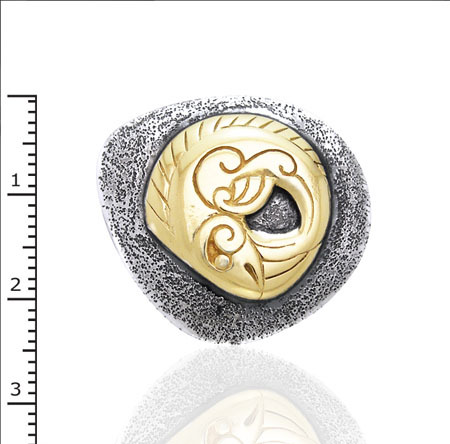 The flowing lines of this single-line knot gives the wearer the feeling of peace, serenity and oneness with all things. Continually returning to the center to create stability and harmony. 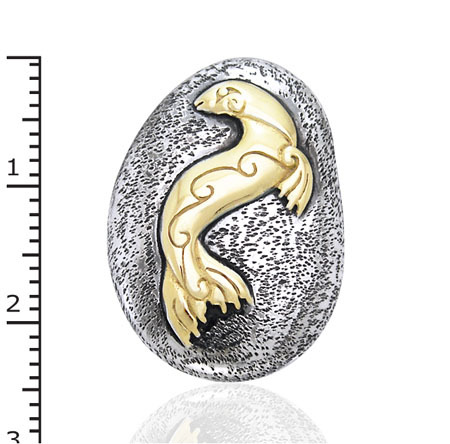 Worn as a symbol of protection, it is believed that this pendant grants you good health and in times of danger you can rely on the powerful earthly elements to give you the strength and courage to persevere and succeed. 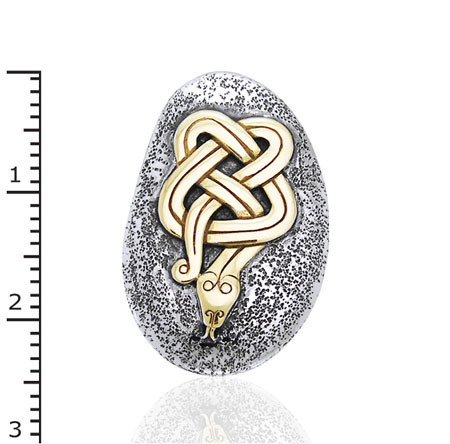 Carried as a symbol of hope and faith, it is believed that once a person comes to a certain time in their lives this knot will unwind showing you the true path your life must take. The powerful symbol of the triskel giving out regenerating energy of the elements is held in balance by the central power of the cross. Both have always been symbols many people have great belief in, and are able to protect them and their loved ones from all evil. The four arms of this cross represent the four stages in your life; birth, youth, adulthood and death. 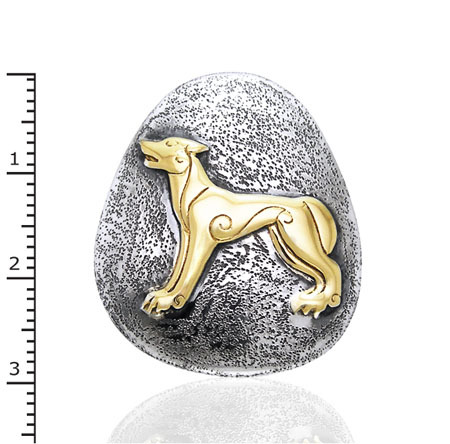 This pendant gives the wearer the strength they need to run the true course of their lives. 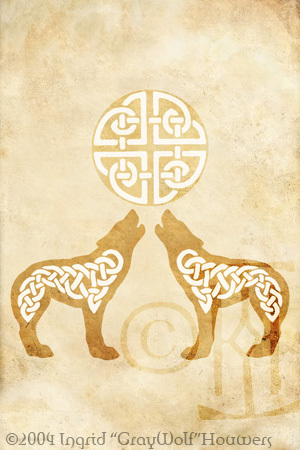 Two Celtic wolves, holding each other close with golden knotwork. Setting free the spirit of the Wild from within. 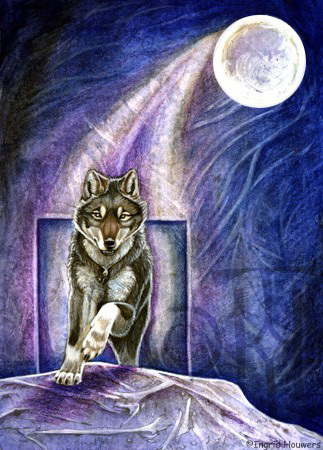 A Wolf running across the snow, guided by dreams. 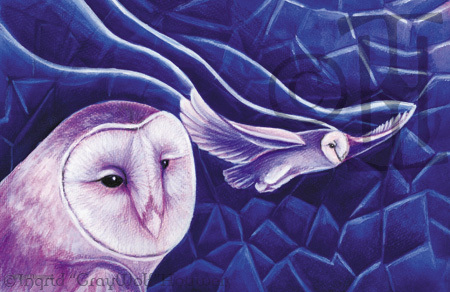 Two Barn Owls, gliding through the night. 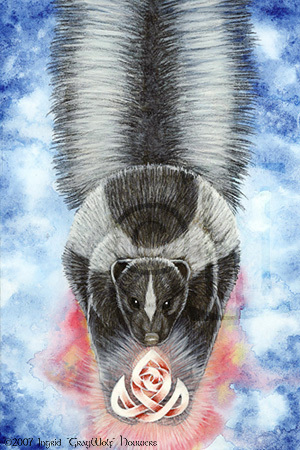 A illustration for the Pathfinders Deck, featuring a Skunk. Skunks have always been avoided because of their ability to spray anyone with that nasty odor. Because of it's reputation skunk symbolizes confidence. You don't want to get in the way of their goal! Attracting the right people and repelling the wrong when needed, they teach us to do what we say, and to 'stick with the plan'. As a negative/reversed aspect, skunk warns you that you may be pushing too many things or people aside to get to your goals, and that you're solitude in this may become a problem. A white elk, bellowing at the last rays of sunlight at the end of the day. 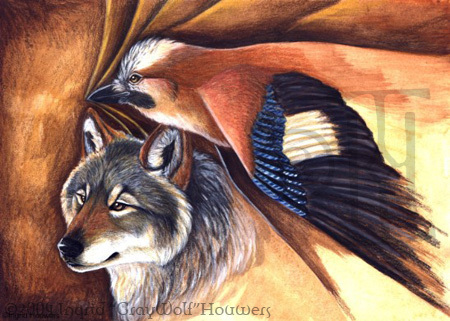 A wolf and a Eurasian jay, two wild spirits together. The dream guardian, watching over your dreams at night. 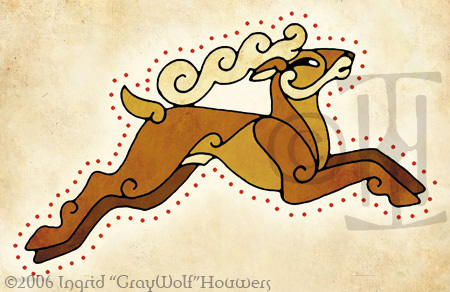 A wolf is running upwards, and over a hill, symbolizing someone overcoming an obstacle. The gentlemen gently grooms his love while holding her close. 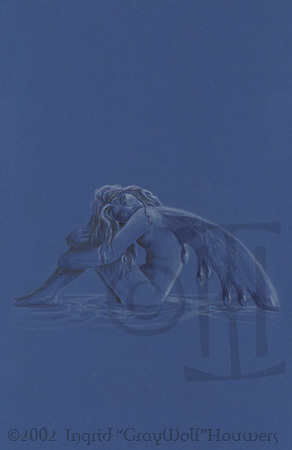 A small water faerie stares at her viewer. A illustration for the Bestiary Card-deck. Three dragonflies flying over the water. A illustration for the Bestiary Card-deck. 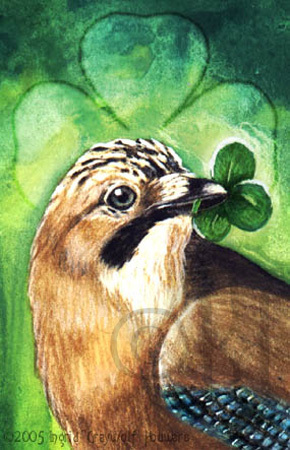 A Eurasian Jay holding onto a clover as the queen of clubs. The Peryton, a lost soul if there ever was one.. These creatures were often seen as winged deer, yet they cast the shadow of a man. They prey on humans, and legend has it they were instrumental in the fall of Rome. 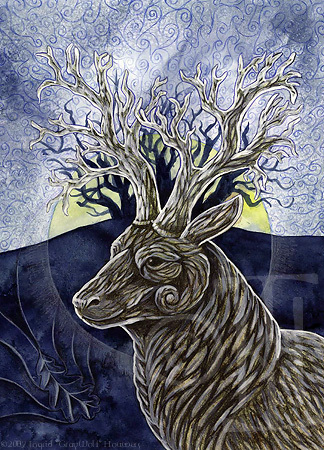 The spirit of the forest in the form of a noble stag. 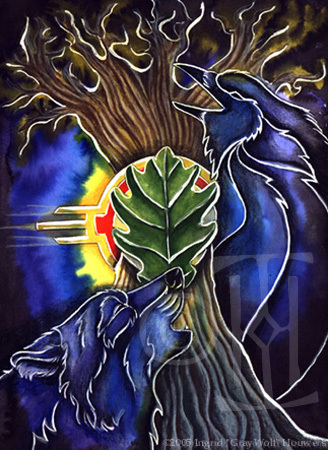 A Wolf and a Crow spirit, telling stories and singing songs underneath the night sky. A traditional fox-coloured kitsune, holding a human faced mask. The kimono is dirty, ragged and not properly tucked in at the top, because although the Kitsune knows how to wear the kimono, she doesn't know it should be presentable. The Irish tale telling how the Fox rids himself of his fleas. 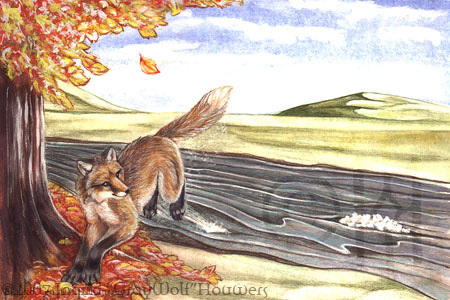 He finds a lock of wool, and holds it in his snout while he slowly, tail first, dips into the water until only his nose is above it. The fleas run into the wool, and at the last moment the fox will let the wool go and emerge from the water, flea free! Elementia, queen of the elements. Her wings rule the winds, her hair rules the waters, her feet the earth and in her hands she holds fire itself. A female wolf takes her favourite ferret buddies for a wee dander outside. 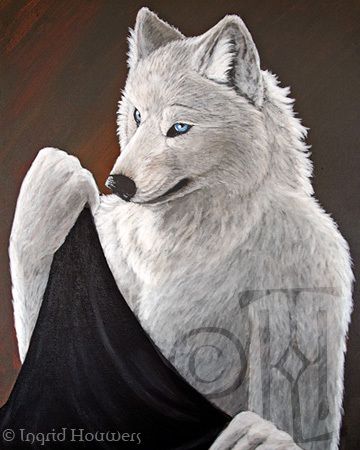 A big white anthro-morphic wolf stands there holding a sheet of black velvet, while giving you an enchanting Arctic stare. 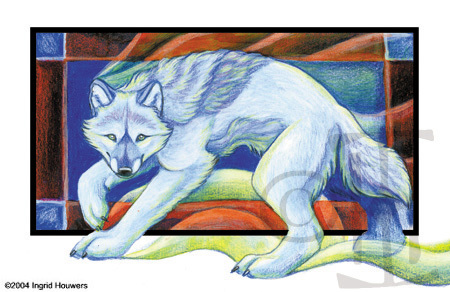 A white ghost-like wolf runs proudly strides across, as dreams flow from her every step. 'Ilchruthach', meaning shape-shifter. Through life we all go through various transformations. These are rarely easy, but through them we become stronger. A majestic wolf, staring out over snow covered fields and forests. 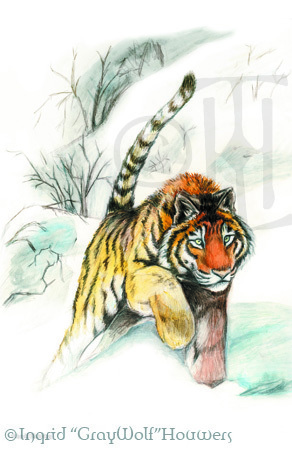 A quick colour portrait of a tiger leaping through the snow. 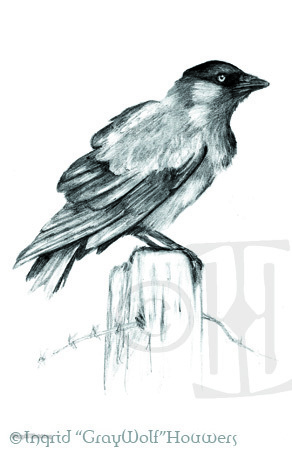 A portrait of a jackdaw, sitting on a old fence pole. 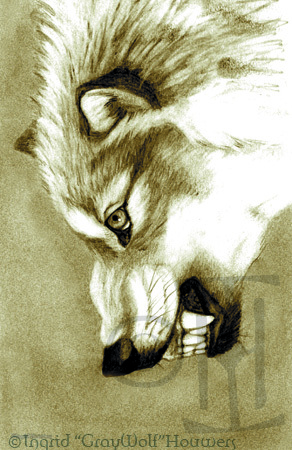 A portrair of a growling grey wolf. A portrait of a grey wolf. A small portrait of Dunca the ferret. 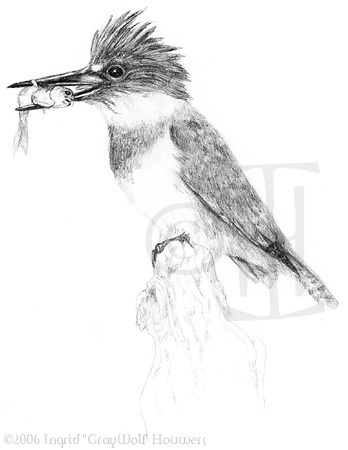 A quick portrait of the wonderful belted kingfisher, along with his catch of the day. 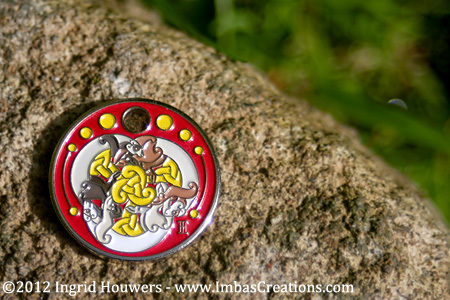 Celtic styling, meets Chinese symbolism. 'Saol fada chugat' in calligraphy, meaning 'long life to you', and in the dead center is the chinese symbol found in the original wufu illustrations. The Wu Fu, or five bats of happiness stand for the 5 blessings; Long life, Wealth, Health, Virtue and natural death. 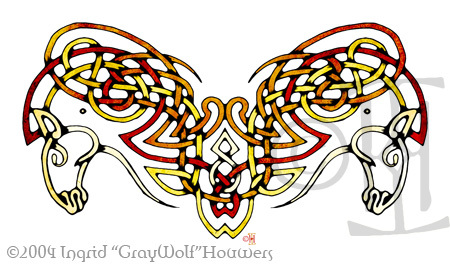 The bats are often painted red, the color of joy, but in this case I did the knotwork red. The Twilight Dreamer, a gorgeous magpie in flight, dreaming of an even longer tail. A illustration for the Pathfinders Deck, featuring the wild boar. 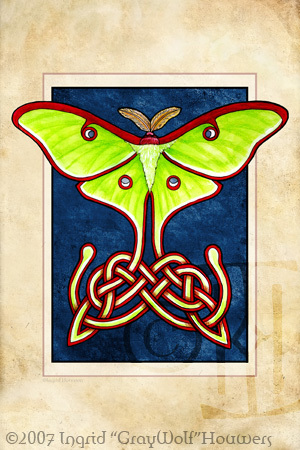 A important power animal to the Celts. It has a close relationship with solar and life giving energies. Orc Triath is the famous legendary boar which goddess Brigit owned. It’s a inspiration bringer in all kinds of arts. 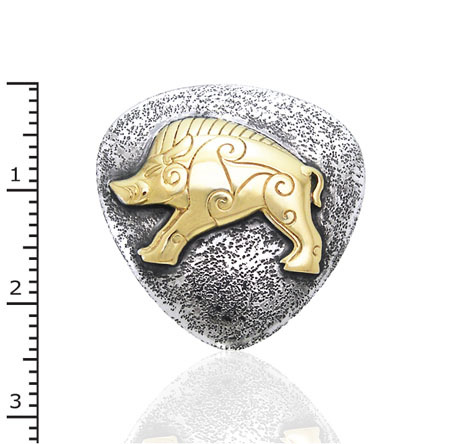 The boar is always rooting for the truth, and on it’s own it stands for strength, ferociousness and cunning. It aids in dealing with troubles that will only be solved by a head-on approach. As a negative/reversed aspect boar shows us we may be losing sight in trying to protect what we value most at the time, and may act more on instinct than reason which could have harmful results for the future. Look before you leap. A Eurasian jay, telling the moon of all the stories and adventures he knows. 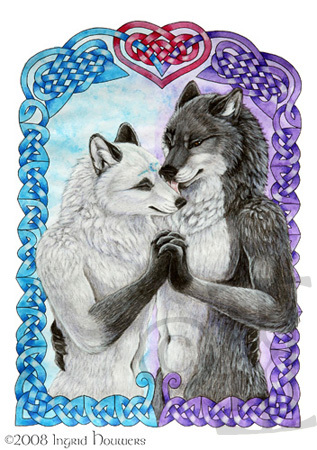 Two winged wolves exchanging a loving touch in mind-air. 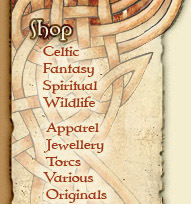 The sacred fire dancers of Tara weave their magic of protection. 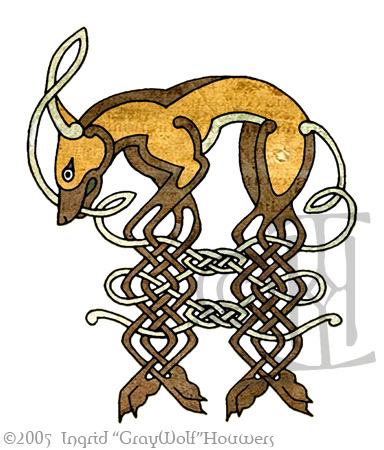 A elegant blend of Celtic and Pictish styles, creating this majestic leaping stag. 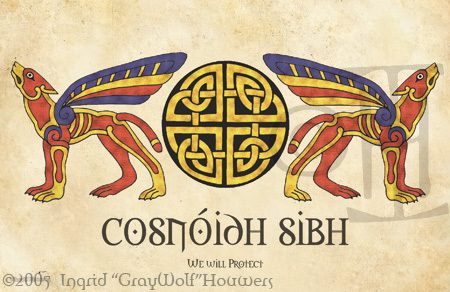 Shapeshifters play a important roll in Celtic mythology. Some people are turned into animals through jealousy, as is the case in the famous Children of Lir story, others choose to do so by magic. 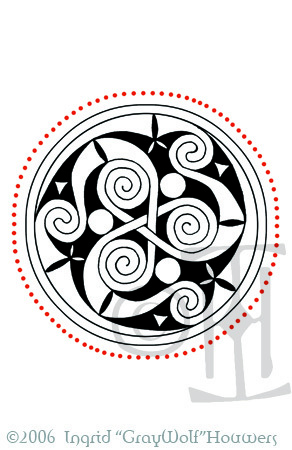 The Triskel is a well-known and well-used symbol in the Celtic culture of both the past and the present. It continues to enchant us to this day. 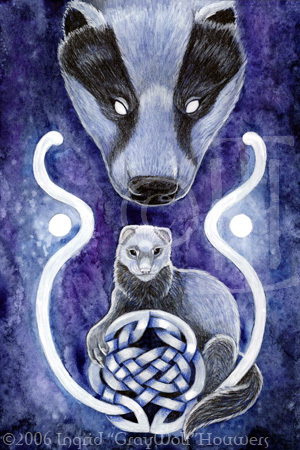 A illustration for the Pathfinders Deck, features a ferret and a badger. 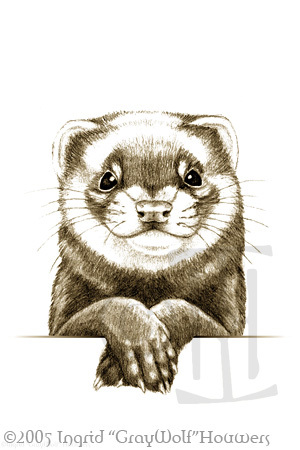 Mustelids are strong protectors and are great for discovering inner talents. They are bendy, and aid us in adapting to new things in life and to always look on the bright side of life. Perfect guides for problem solving, they’ll show you there’s so much in life still to do. Enjoy it! As a watcher over the top the badger embodies courage. 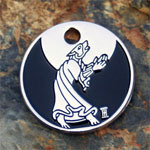 Badger will teach you to fight for your rights and spiritual beliefs and guides you through dreams. As a negative/reversed aspect it warns you to not become to care-free while you’re having fun. Don’t spend all your resources since there may come a time when you need them. 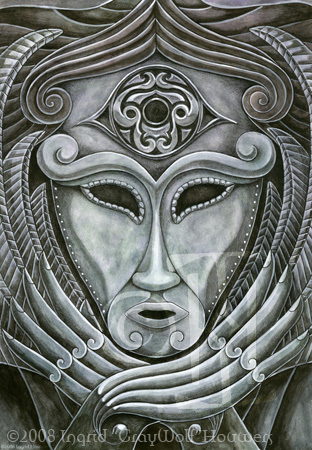 A portrait of Morrígan, loosely based on the bronze mask-brooch find from Czechoslovakia dating back to mid-4th century BC. She's often seen as a war deity, fore-telling deaths, but with her association to cattle she can also be considered as a deity of sovereignty, wealth and fertility. Two Celtic lovers, holding hands. 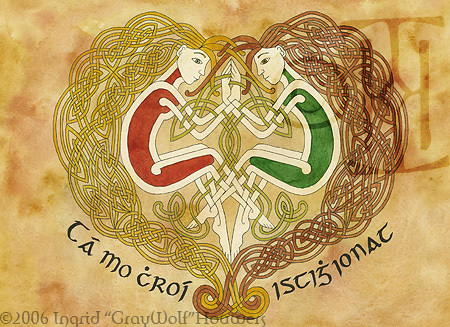 The gaelic underneath their loving image reads; "Tá mo chroí istigh ionat", which means "my heart is within you". With their long ears and legs, the maned wolf is a very elegant creature to behold. 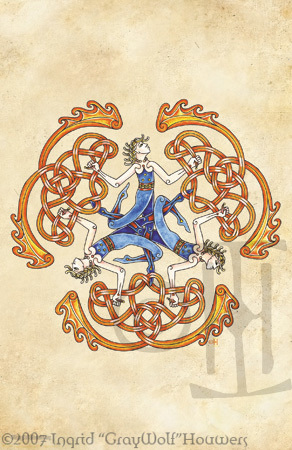 Though with the knotwork for legs it does look a wee bit clumsy.. The bright colours of this enchanting animal make it such an otherworldly creature. And next to that, it's long 'tails' lend themselves excellently for knotwork patterns. A portrait piece of Lugh, a light deity, but in short he's good at everything he does. Let into Tara in a time when only the best artisans were let in. They pretty much had the master in every art&craft type there was, but when Lugh asked them if they had anyone that was a master at ALL crafts they admitted they didn't, and he got in. He's featured here with the spear that, in the Welsh version of one of his tales, pierces a stone to kill the hunter which had an affair with his wife. 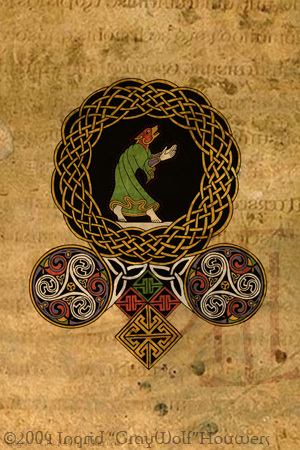 And, in the irish version, he himself is killed by it, after his wife finds out a way to kill Lugh and tells her lover. He's also holding a stone sling, which Lugh used to disable Balor's (his evil grandfather, Champion of the Fomorians) all-destructive eye. In other versions Lugh blinded Balor with a spear made by Goibniu, and thus we return back on the spear. Knotwork is done with gold inks, and some silver dots. 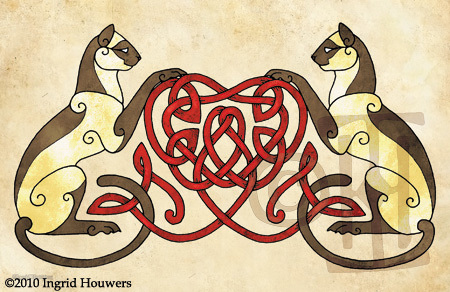 Two cats bound together in a loving Celtic cuddle. 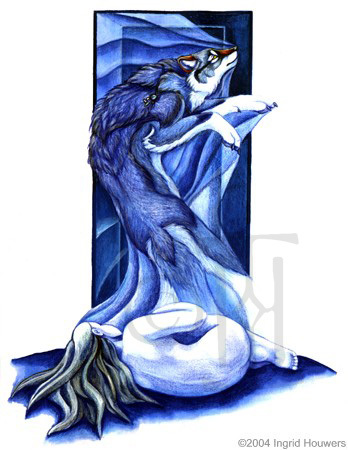 Two wolf shapes can be made out, howling at the moon up above them. Their figures are filled with Celtic knots. The noble majesty of the horse, knotted together. 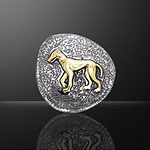 The famous story of Gelert, the hound of Prince Llywelyn, that fought the grim wolf to protect the Prince's son. 'Dílis go bás', 'loyal until death'. 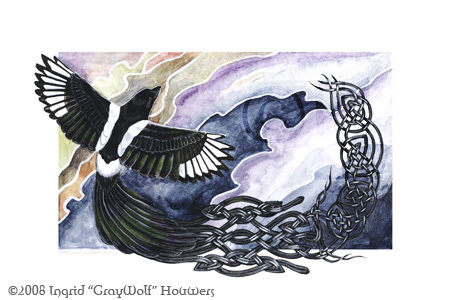 A illustration for the Pathfinders Deck, featuring the Raven, Crow, Hooded Crow, Magpie and Eurasian Jay. Corvids have long been symbols for war and death and as a symbol they should be treated with care. 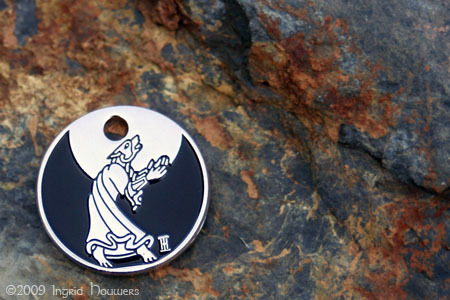 However, they also symbolise rebirth, and give us the strength needed to part with things we don’t need, big or small. 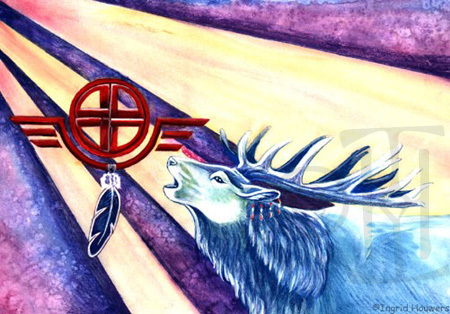 They guide us in the shadows, carry souls from darkness into the light, and help in the honouring of ancestors. They are skilful and cunning, and a great aid when trickery is needed. 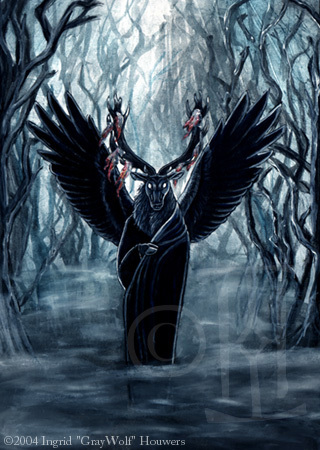 As a negative/reversed aspect, corvidae may be warning you that you are becoming to obsessive about something. 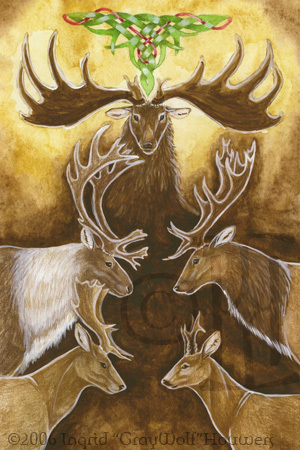 A illustration for the Pathfinders Deck, featuring the (extinct) Irish Elk, Caribou, Red Deer, Fallow Deer and Roe Deer. The female aspect of the cervidae teaches us unconditional love and gentleness, both for ourselves and others. They are natural wanderers and aid us in our own journeys. The male aspect of this card gives us energy to carry on and do what needs to be done, but at the same time use no more energy than needed to accomplish our goals. As a negative/reversed aspect it may be warning about trying to reach a goal that is currently out of range and not wanting to give up. There will be better times. 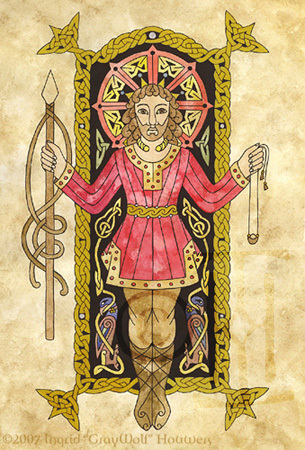 A portrait of Cernunnos, posed in the same position he is posed in on the Gundestrup cauldron but styled after the Book of Kells. 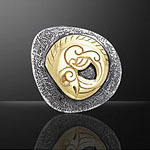 This design features two big snakes, two herons and a tree of life. 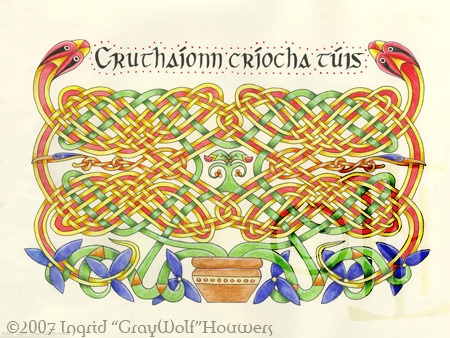 The text at the top 'cruthaíonn críocha tuís' means 'endings create beginnings'. 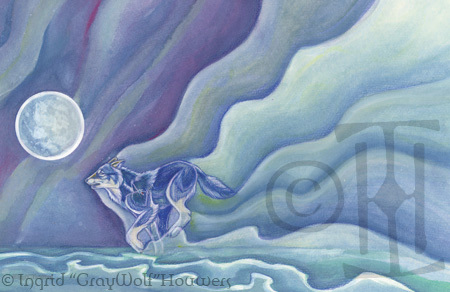 Copyright © 1997 - 2012 Ingrid "Graywolf" Houwers. All rights reserved.